Flood - Selective | Special Feature | Thanksgiving Traditions | Webinars | Parting Shot | TRIVIA! Discover the innovative ARMR HPR insurance product that is needed on all commercial properties! Join us for the nationwide retail broker training on January 4th to learn more! Big "I" Flood's carrier partner Selective knows that growing your business is vital and they are here to support your growth. This complimentary tool is all part of the value that Selective provides to its valued agency partners. Visit www.selectivefloodmarketing.com, and the new Distributed Marketing Platform login screen will appear. You will need to complete a registration process to create a new account that should be approved within 24 business hours upon request. Learn more about the Big "I" Flood program at www.iiaba.net/Flood. Please take a moment to view a short video regarding the upcoming Trusted Choice campaign on CNBC. Trusted Choice Executive Director Kevin Brandt (starring in the video) just returned from Houston following production work on the new TV ads. Starting in January, Trusted Choice ads will appear on CNBC's TV show Billion Dollar Buyer. Host Tilman Fertitta is the CEO & owner of Landry's, Inc., the leading dining, hospitality & entertainment company in the country. Some of the entities he owns are: Morton's Steakhouse, Bubba Gump Shrimp Company, the Golden Nugget casinos, Oceanaire, the Chart House, Saltgrass Steak House, and many more. Tillman has cut TV ads for Trusted Choice on insurance issues, and he endorses using Trusted Choice independent insurance agents! All of the ads end urging consumers to go to www.TrustedChoice.com to find a Trusted Choice agent. Access the Trusted Choice program branding resource site here, and watch Big "I" publications for more information on the upcoming ad campaign. As with many holidays, Thanksgiving in America has evolved over time. 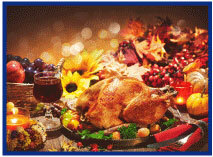 The first recorded Thanksgiving meal may have been in the mid-1500s in Texas or Florida. Other countries celebrate their own version of Thanksgiving, complete with their own traditions, at different times of the year. Here are a few myths, traditions, and myths about traditions surrounding Thanksgiving in America. Each Thanksgiving Day since 1947, the President of the United States has been presented with three turkeys by the National Turkey Federation. One live turkey is pardoned and gets to live the rest of its life on a quiet farm; the other two are dressed for the Thanksgiving meal. The practice is said to have informally begun with Abraham Lincoln, who granted a pardon to his son Tad's pet turkey. Those who remember this famous scene from WKRP know that domesticated turkeys cannot fly. Wild turkeys, on the other hand, are smaller and more agile. They can reach speeds of up to 20-25 miles per hour on the ground and fly for short distances at speeds approaching 55 miles per hour. They also have better eyesight and hearing than their domestic counterparts. The newly formed American Intercollegiate Football Association held its first championship game on Thanksgiving Day in 1876. At the time, the sport resembled something between rugby and what we think of as football today. By the 1890s, more than 5,000 club, college and high school football games were taking place on Thanksgiving, and championship match-ups between schools like Princeton and Yale could draw up to 40,000 fans. According to the Cape Cod Cranberry Growers' Association, Native Americans used cranberries in a variety of foods, as a medicine to treat arrow punctures and other wounds, and as a dye for fabric. The Pilgrims adopted these uses for the fruit and gave it the name "craneberry" as its springtime drooping pink blossoms resemble a crane. Turkey does contain the essential amino acid tryptophan, which is a natural sedative, but so do a lot of other foods, including chicken, beef, pork, beans and cheese. Though many people believe turkey's tryptophan content is what makes many people feel sleepy after a big Thanksgiving meal, it is more likely the combination of fats and carbohydrates most people eat with the turkey, as well as the large amount of food (not to mention alcohol, in some cases) consumed, that makes most people feel like following their meal up with a nap. The Turkey Trot, modeled on that bird's characteristic short, jerky steps, was one of a number of popular dance styles that emerged during the late 19th and early 20th century in the United States. A simple dance that required little to no instruction along with the one-step, the two step, the fox trot and the bunny hug, which could all be performed to the ragtime and jazz music popular at the time. Benjamin Franklin wanted the turkey as the national bird? False, although he didn't like the bald eagle. His comments to his daughter regarding how the eagle design on the Great Seal looked more like a turkey have been exaggerated over time. Here are some statistics to chew on. We hope you all have a wonderful, safe, and happy Thanksgiving. Congratulations to our agent in South Dakota on a Small Commerical sale of $2,929 in premium!